The 1984 miner’s strike was a form of natural disaster. It causes were largely organic, its immediate effects were uncontrollable and the fallout left a trail of devastation. Much has been written on the subject from those within the industry and outside it. Social commentaries and debates by Politicians and Historians abound marking its place, quite rightly, in the chequered Social, Industrial and Political history of Britain. In the Universities it’s a ripe topic for dissertations and many a thesis, and at grass roots level there have been many accounts from those who lived through it. I am one of them. At the time I was 24 and not long married to a miner. My father was a miner, as was his before him and my in laws were part of an extended family of miners. I was born, raised and lived in a mining community in Nottinghamshire where it was virtually impossible to walk five miles in any direction from any point on the county map and not find yourself in another pit yard. The whole world and his uncle were miners, with a long history of miners behind them. I, like all of them had coal dust in my veins and as proud as I was, and still am of the fact, because Heritage is important, I was probably in a minority who didn’t think it was entirely a good thing. In 1978 I left college after spending two years studying politics and economics and was still very much a coal miner’s daughter when I applied for a job at British Coal area HQ. Fired up with moderate left wing political views and a deep dislike of injustice, I was already aware that the girls in the pit canteen got a share of the productivity bonus and thought it slightly dodgy. After two in depth interviews I was called back for a third and sat nervously on a wooden chair facing a committee of interviewers. The interview was long and fairly positive. I was relaxed and confident; it was all going really well. “So,” a guy in a suit and spectacles smiled. “The starting salary would be £70 a week (£340 in today’s money) with 100% pit bonus,” he leaned in with the expression of a man sure of response wilting with gratitude from an impressionable 18 year old. I was not called back again. My views never really seemed to fit on either side of the fence. I was a realist even then with a strong sense of my parentage, and it had been drummed into me from an early age that you don’t get owt for nowt. If you want something its only right that you work for it and it’s better to expect nothing, then you’ll never be disappointed. 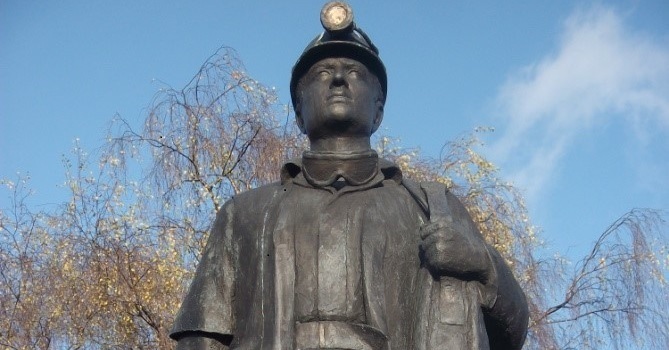 When I was young enough for the school holidays to drag and Christmas not to come soon enough, I was blissfully unaware of the amazing heritage of being a coal miner’s daughter in Nottinghamshire. Apart from being the accepted home of Sherwood Forest and that small scattering of ancient woodlands and one particular tree that are lovingly preserved in its name, Nottinghamshire has been an important part of the coal industry for centuries. Sitting on the carboniferous remains of a dense forest, coal was mined there long before the NUM was ever a conceptual gleam in radical socialist’s eye. The Romans mined coal in Britain, and somewhere in the archives is the record of a mosaic floor of a Roman mansion unearthed in a farmer’s field not far from the house where I was born that was ploughed up when the farmer found that people insisted on trawling across his field to look at it. I’m pretty sure the same field was the last resting place of an unexploded bomb during the second-world war. Some farmers, it seems, are just plain unlucky. Surface mining is recorded at Cossall and Selston in the 1270’s and continued to grow and spread. By the 17th Century shallow mining was a major industry in the county and Henry the VIII dropped a wife off in Nottingham once, but she soon left again because the smoke from the coal was too much to bear. By 1870 the county had 50 coal mines producing 2m tons of coal. By 1905 the same pits were producing over 10m tons. In the early 20th century the UK led the world in coal production. At over 230m tons per year, it almost doubled the production of Germany. The Royal Coal Commission estimated in 1905 that the life expectancy of the Nottinghamshire coal field was 500 years and when joined with neighbouring Yorkshire and Derbyshire, there were enough resources to equal South Wales. Nottinghamshire was one of the last coal fields to be deep mined with all the latest technology of the early 20th century. Continual investment saw new pits being sunk in the years before and after Nationalisation in 1947, drawing men from the declining coal fields around Britain. New purpose built village communities appeared to house a rapidly growing population of miners and feed an energy industry that was coal reliant. Modern pits were here to stay, producing 3000 tons a shift and employing 1000 men per pit for as long as anyone cared to imagine.